Crewe - Virgin Trains will be painting the full script of iconic festive film 'It's a Wonderful Life' on station platforms from London to Glasgow. The campaign, which has been created to remind people of the importance of simple kindness this Christmas, was developed in collaboration with Virgin Trains' charity partner, Rethink Mental Illness. The script of It’s A Wonderful Life has been painted onto railway station platforms as part of a mental health festive campaign. Over a three-week period, workers spent more than 60 hours painting over 4.5 miles of words overnight across the UK. 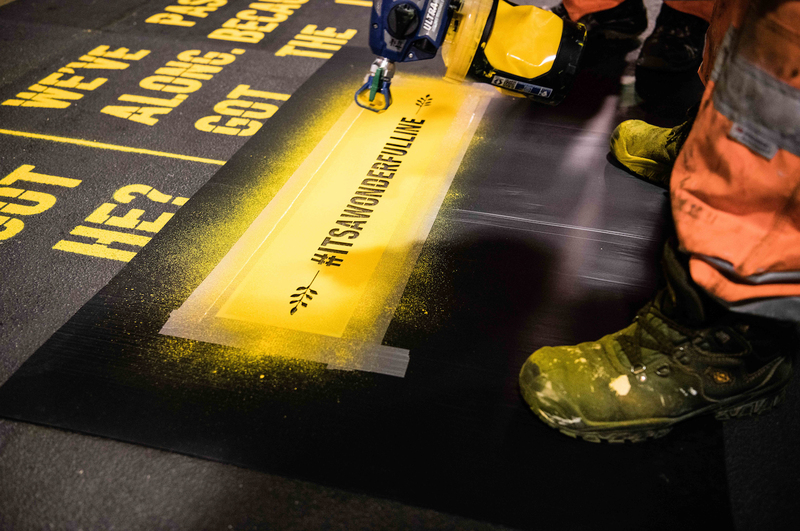 Final lines of the film – from Auld Lang Syne by Scottish poet Robert Burns – were painted at Glasgow Central station, having started at London Euston last month. The initiative was developed with Virgin Trains’ charity partner Rethink Mental Illness in recognition of how difficult the festive period can be for some. Colin Leslie at Rethink Mental Illness said: “At Christmas time in particular, we wanted to ensure people know that help is available if they need it. “Over the past two years, our partnership with Virgin Trains has been designed to raise funds so that more people can access support in communities along the West Coast network. Frank Capra’s 1946 film, a regular fixture in living rooms across the festive period, is a story of family, love, hope, and redemption. But it is also the story of one man’s struggle with life’s knock-backs and disappointments. The script has stretched its way up the UK to spread the film’s message of goodwill in locations including Birmingham, Liverpool, Preston, Carlisle and Glasgow. Natasha Grice, executive director of people at Virgin Trains, added: “Across our rail network, many of our people have been personally affected by the issues touched on in this campaign, which is why we are delighted to have included so many of them in making it happen.